Happy Friday everybody! This week's quilt is the mellow older brother of the bright patchwork I posted a few weeks ago. This pretty patchwork of 4" squares was made by picking a focus fabric and then pulling fabrics that matched it. It's a Covered in Love quilt and, in fact, is already up at the hospital! Meloney worked her magic again and quilted lovely leaves all over in a green thread. The picture below shows a good closeup of the quilting and the center fabric was my "focus fabric" which inspired all the other fabric choices. If you'd like to join in with Covered in Love's mission you can learn more on the main page or check out the block drive. The current Covered in Love block drive just began and it's a simple patchwork in Fall colors This drive will run until the end of October if you want to help out. More info here! Lovely quilt. Simple pattern but fabrics really work well together. This one is soft and lovely! 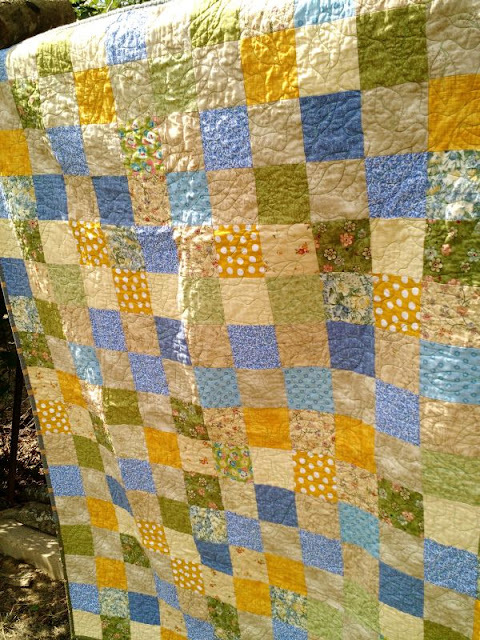 The leaf quilting in green works really well with the pretty fabrics. I love quilts made of simple squares. Very nice quilting, also. I will, sooner or later, make some blocks for you. Maybe this month will be it. Am I correct that they have to be 12 1/2" blocks? 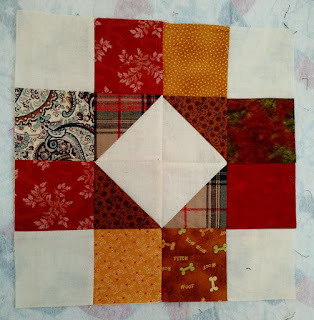 How do you feel about hand pieced blocks? 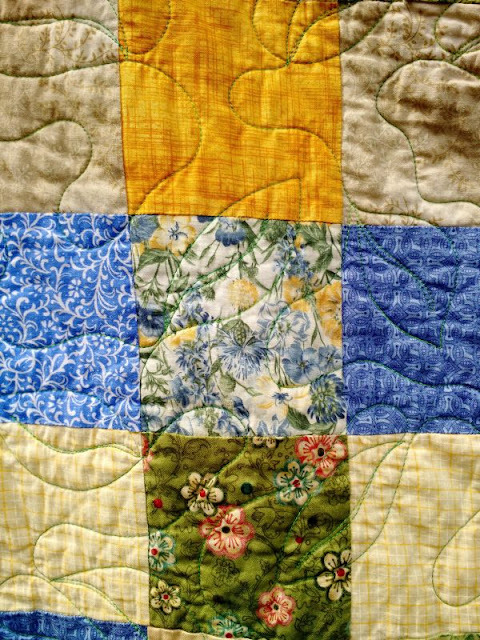 What a beautiful, cheery yellow quilt. 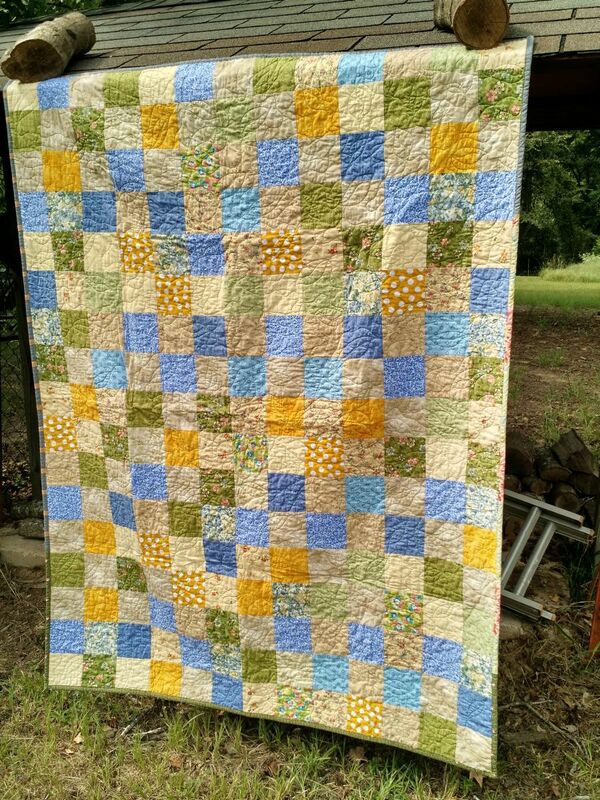 You did a great job with the color combos & Meloney did her magic in quilting it. I like the leaf design in the quilting. I need to get more adventurous & start using different colored threads. Thanks for another beauty! 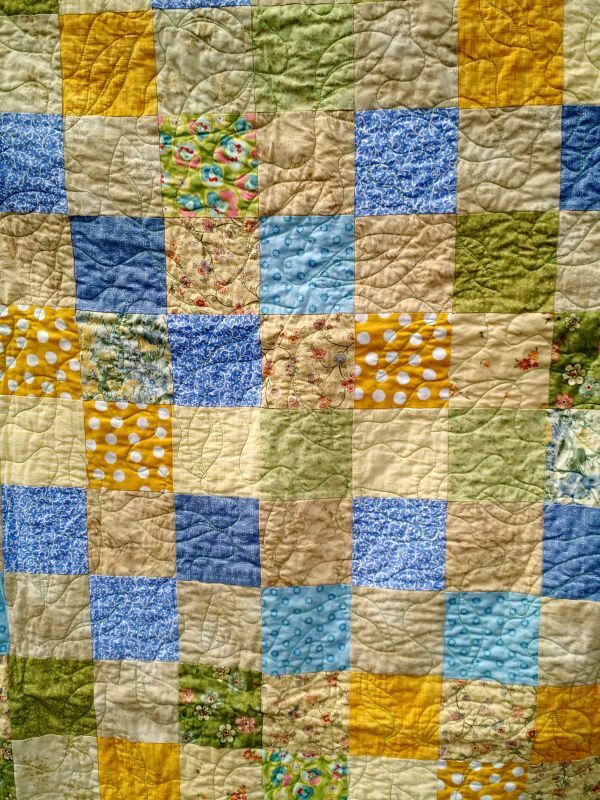 Simple patchwork quilts are some of my favorites. They are all about color and fabrics. Thanks for linking up with Oh Scrap!